We’re now a Social Enterprise! We’re delighted to announce that we are now officially registered as a Social Enterprise Community Interest Company. 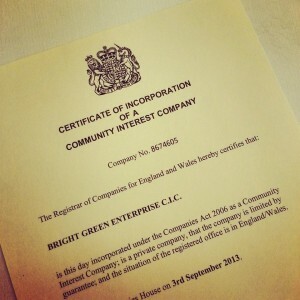 As of the 3rd September, we gained our certification as a Social Enterprise and are now Bright Green Enterprise C.I.C. Social Enterprises are Not-for-Profit social mission driven organizations which apply market-based strategies to achieve a social purpose. A Community Interest Company operates within these parameters and for the benefit of the community (or the wider community in our case). We see a social enterprise as being positioned between the for-profit sector, operating for share holder benefit, and a charity. This means that over 50% of a social enterprise’s income must come from a form of market-based trade. What can this offer our partners? Choosing the social enterprise route, we can access a variety of ways and means to continue carrying out our work in Africa; ultimately enriching the learning experience of young people in the UK as well as those abroad. If you think you could help us develop the work we do in Africa or the UK, whether you are a business or enterprising individual, please get in touch. We would love to hear from you.